“The law should penetrate our motivations, our secret intentions, and so be part of our intimate self. It’s another expression of having the Pauline promise of ‘Christ in you, the hope of glory’ (Col. 1:27), be a reality in our lives (p. 30). “However, obedience to the law and the principles it represents continues to play a central part in the life of faith” (p. 31). “The law is the perfect antidote against the ‘flattering tongue of a seductress’. Only the imperative of the law and the duty of obedience will help us resist her alluring words” (p. 32). “‘He who, endowed with high conceptions of life and truth and honor, does yet willfully transgress one precept of God’s holy law, has perverted his noble gifts into a lure to sin’” (EGW quoted on p. 33). This lesson completely misrepresents the purpose and the role of the law. First, when the psalmists and the author of Proverbs use the word “law”, they are not referring specifically to the 10 Commandment. They are referring to the whole of God’s word. The Scriptures that they had were the “law”. In fact, the context of these writings are not referring primarily to the 10 Commandments but to all of God’s revealed will for them. Second, the law was never intended to reveal to Israel how to be righteous nor how to please God. Its purpose was to reveal their sin, to convict them of their depravity that rendered them UNABLE to keep the law. The law was intended to increase their sin and to drive them to the despair that would cause them to cry out to God for deliverance. It was intended to foreshadow the true righteousness of God which does not come in any way from the law (Rom. 3:20-21). But now the righteousness of God has been manifested apart from the law, although the Law and the Prophets bear witness to it—the righteousness of God through faith in Jesus Christ for all who believe. For there is no distinction (Romans 3:20-22). Therefore, just as sin came into the world through one man, and death through sin, and so death spread to all men because all sinned—for sin indeed was in the world before the law was given, but sin is not counted where there is no law. Yet death reigned from Adam to Moses, even over those whose sinning was not like the transgression of Adam, who was a type of the one who was to come (Romans 5:12-14). Now the law came in to increase the trespass, but where sin increased, grace abounded all the more (Romans 5:20). But sin, seizing an opportunity through the commandment, produced in me all kinds of covetousness. For apart from the law, sin lies dead. I was once alive apart from the law, but when the commandment came, sin came alive and I died (Romans 7:7-9). For God has done what the law, weakened by the flesh, could not do. By sending his own Son in the likeness of sinful flesh and for sin, he condemned sin in the flesh, in order that the righteous requirement of the law might be fulfilled in us, who walk not according to the flesh but according to the Spirit (Romans 8:3-4). The sting of death is sin, and the power of sin is the law (1 Corinthians 15:56). The law was never give either to save us nor to help us to stay saved. The purpose of the law was to reveal and to increase sin in us. It wast to point out specific immoral behaviors and to draw one’s attention to those behaviors. For example, unless a person see a sign saying, “Do not jump in the elevator”, most people would not think of jumping. Once they see a sign, however, that forbidden activity is front and center in their consciousness. 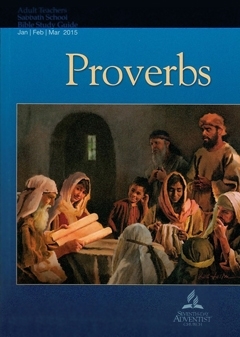 This week’s lesson looks at some powerful proverbs and turns them into mere moralizing. Moreover, it threatens the reader with “annihilation, the opposite of the eternal life that God wants us all mohave through Jesus Christ” (p. 34). Absolutely no one can avoid sin by deciding to place the law in one’s mind and heart. To be sure, hiding God’s word in our hearts is definitely the way we learn what is real and what is truth. Nevertheless, the power to avoid sin does not come from reading the law. The law only condemns us, because none of us is without sin. The only way to avoid sin is to allow the law and the entire word of God to convict us of our depravity and to turn to the Lord Jesus who offered the perfect, complete substitutionary atonement for our sin. When we believe in Him, we are born again and sealed with the Holy Spirit of promise (Eph. 1:13-14). At that moment we pass from death to life (Jn. 5:24). Instead of hiding behind moral absolutes and requirements, I implore you to turn to the Lord Jesus and ask Him to make His entire word come alive to you. Acknowledge your utter sinfulness, your dead spirit with which we all are born, and believe in the Lord Jesus. He will bring you to life and seat you with Him in heavenly places (Eph. 2:4-19). The proverbs will only make sense when we are alive in Jesus. When we know Him and have received eternal life, we will realize that the wisdom behind the proverbs is the wisdom of the Lord Jesus, not men. It reveals how a life lived in submission to Jesus and to His word looks. It is not a list of behaviors we must aspire to achieve; rather, it is a look at the life of wisdom, the life that sees the contrast between sin and trust in God. Copyright 2015 BibleStudiesForAdventists.com. All rights reserved. Revised January 12, 2015. This website is published by Life Assurance Ministries, Camp Verde, Arizona, USA, the publisher of Proclamation! Magazine. Contact email: BibleStudiesForAdventists@gmail.com.